For the study, published this week in the journal Restoration Ecology, researchers installed 11,000 small, hexagonal structures called "spiders" across 5 acres of reef in the center of Indonesia's Coral Triangle. Coral diversity is the highest on Earth in that region but is threatened by human activity, including overfishing, pollution and climate change. Between 2013 and 2015, researchers attached coral fragments to the structures, which also stabilized rubble and allowed for water to flow through freely. Live coral cover on the structures increased from less than 10 percent to more than 60 percent. This was more than what was reported for reefs in many other areas of the Coral Triangle, at a cost of about $25 per square meter. "Coral reef rehabilitation and restoration efforts are rapidly increasing around the world, but there are few large-scale examples of successful projects," said corresponding author Christine Sur, who was a UC Davis graduate student at the time of the study. "Our study demonstrates a cost-effective, scalable method that can inform other coral reef restoration efforts aimed at reducing the global decline of these valuable and unique ecosystems." Of particular surprise, while massive coral bleaching decimated other parts of the world between 2014 and 2016, bleaching in the rehabilitation area was less than 5 percent, despite warm water conditions known to stress corals. The study is one of the last publications led by Susan Williams, a professor and marine biologist with the UC Davis Bodega Marine Laboratory and Department of Evolution and Ecology who passed away in April 2018. "Collaboration played a key role in the study's outcome," said corresponding author Jordan Hollarsmith, a doctoral candidate in the UC Davis Graduate Group in Ecology at Bodega Marine Laboratory. "Dr. Williams' dedication to building true partnerships between industry, local scientists and the people who live by the reefs she worked to rebuild was critical to this project's success." Mars Symbioscience, a business segment of Mars, Incorporated, initiated the project in 2013 in collaboration with local residents on the islands. 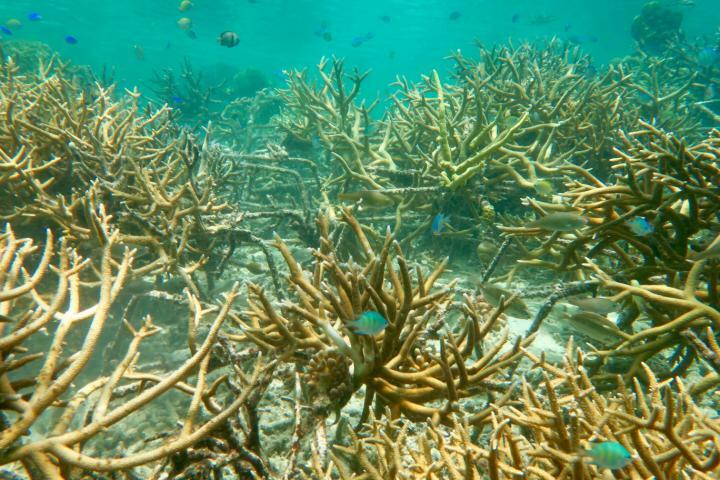 "This research is an important step in demonstrating how coral can be restored to a higher degree of cover quite quickly and at a relatively low cost," said Frank Mars, vice president of Mars Sustainable Solutions. "Healthy coral reef ecosystems provide natural coastal protection and are the foundation for many local fisheries, as well as jobs for tourism. They also play a critical role in the Mars supply chain as they provide food security and work for the families and communities we rely on to grow the raw materials we use in our brands around the world. For Mars, helping restore coral reefs is not only a business issue, it's also the right thing to do to ensure the planet, people, and communities that rely on them are healthy and thriving." Coral reefs are declining worldwide. Reversing their decline will require fully addressing climate change and other human impacts, the study said. For instance, illegal fishing, lack of island sanitation systems, threatened seagrass communities and marine debris such as plastic pollution are common issues in Indonesia and many tropical environments. People living in small island communities in this region also have few alternatives to fishing livelihoods and often lack access to education about the ocean environment. In the meantime, the "spider" technique and restoration projects offer a way to rehabilitate large swaths of coral reefs and the communities that depend on them, giving the reefs a chance to adapt or acclimate to worsening ocean conditions. Additional co-authoring institutions include Hasanuddin University in Indonesia. The research was supported by grants from the National Science Foundation, UC Davis Agricultural Experimental Station and United States Fulbright program.